This simple but powerful tool will show you how much money you’ll need for your dream road trip AND record your finances as you go. Let's face it, if money were no object most of us would be packed and out the door on a perpetual 'big lap' of Australia by tomorrow lunchtime. But the reality is that money matters so if you're wondering how much money you'll need for your road trip around Australia AND you’d like a way to track your finances as you travel, then you've come to the right place. The free version of our Big Lap Budget Spreadsheet does a great job of helping you work out how much money you'll need for your big road trip before you go. But for some people, it's not enough, which is why we created the 'Extended' Big Lap Budget Spreadsheet. Going beyond where the free version leaves off, the Extended Big Lap Budget Spreadsheet will show you how much money you'll need to start with AND enable you to keep tabs on your income and expenses as you travel. It's easy, accurate and fast and will help you to avoid those dreaded 'cost blowouts'. The easiest and fastest way to plan your ultimate road trip budget. 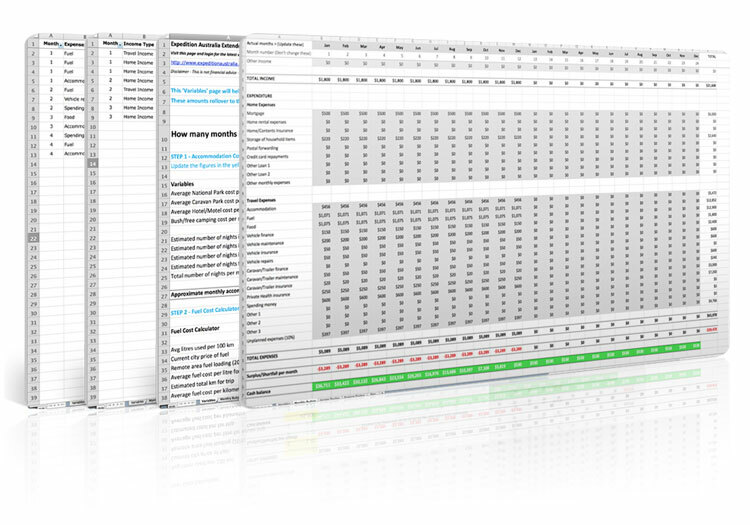 The first page of the spreadsheet is the ‘Variables’ page which will take all of the details of your planned trip and your finances and give you a snapshot of how much money you'll need each month based on your unique trip plan. Including details like . .
As you enter these details you'll see the bottom line update in real time so you can keep 'massaging' the numbers until it works. The second page of the spreadsheet uses the variable from the first page and extended the budget over all of the months of your trip (up to 2 years). So now you can see your financial position month by month. From here you can add in any once off or recurring expenses or income in the months they will happen. Finally, the last 2 pages in the Extended Big Lap Budget Spreadsheet are there for you to add your income and expenses as you travel to help you avoid cost blowouts and so you’ll end up with a complete picture of your trip’s budget when your finished. 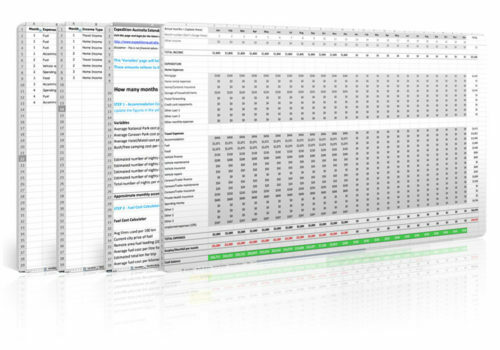 Your download includes a comprehensive PDF User Guide and two versions of the spreadsheet. A simple version in Excel .xls format which will open in any compatible spreadsheet program and a native Excel .xlsx version which takes advantage of some of the formatting features in the latest versions of Microsoft Excel.